The frog creatures of Titan Quest Immortal Throne inhabited the swamp & marshes of Ancient Greece. 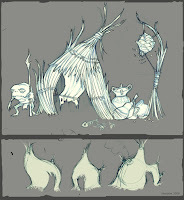 These primitive, but clever little creatures constructed huts from the tall reeds and grasses in the swamps. Crudely formed pots & vessels were made from the abundance of clay in the soil and glowing starfly nests were attached to strung reeds and used for lanterns. These critters may seem unassuming and cute, but when attacked in groups, these frog creatures can chew you down to your bones. Be careful!